The BIOPTRON YouTHron®, “The American Version of the MedAll”. 30 years of intensive research, hundreds of clinical trials, and significant investment make BIOPTRON the world’s leading Light Therapy Device for health and beauty. BIOPTRON YouTHron® is designed for use at home, in hospitals, sports & wellness centers and in therapeutic clinics. Small yet powerful, the Swiss-­made medical light system is clinically proven and certified across the world, for faster healing and pain relief of numerous medical conditions. The device comes in a handy plastic case for smart storage and transport. The filter diameter treatment area of BIOPTRON YouTHron® is approximately 5cm. The 100% safe spectrum of BIOPTRON polychromatic light does not contain any UV radiation. BIOPTRON MedAll is designed for use at home, in hospitals and in therapeutic centers. The device is easy to handle and is equipped with a convenient timer that beeps every two minutes. The device comes in a handy plastic case for smart storage and transport. The filter diameter of BIOPTRON MedAll is approx. 5 cm. Bioptron treatment may encourage positive changes in one’s complexion. 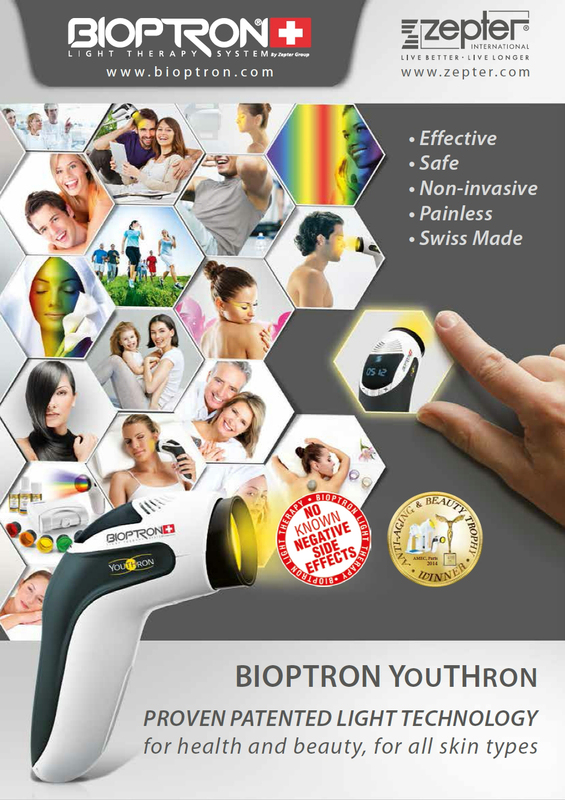 The skin exudes a glowing radiance, feels smoother, and looks healthier after using BIOPTRON Light. The BIOPTRON Light Therapy System is a worldwide patented light therapy medical device with a specific optical unit emitting light that is similar to the part of the electromagnetic spectrum produced naturally by the sun but with no UV radiation. Being a natural pure product it is compatible with any cosmetic treatment you may be using, while enhancing it’s effect. 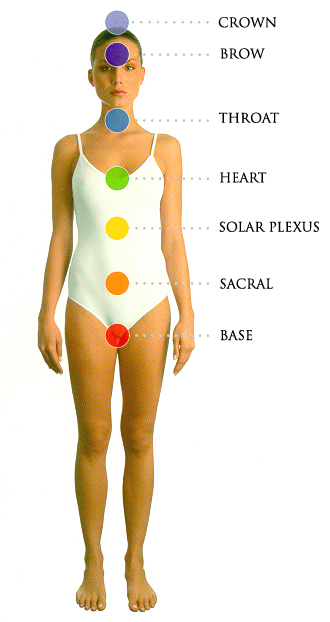 The BIOPTRON Colour Therapy provides well-being for health-conscious people. Using the SEVEN colours of the spectrum, BIOPTRON Colour Therapy aims to balance and enhance our body’s energy centres and also to help stimulate our body’s own healing process. BIOPTRON uses Lumia Therapy colour to re-balance our energy centres that have become depleted of energy. 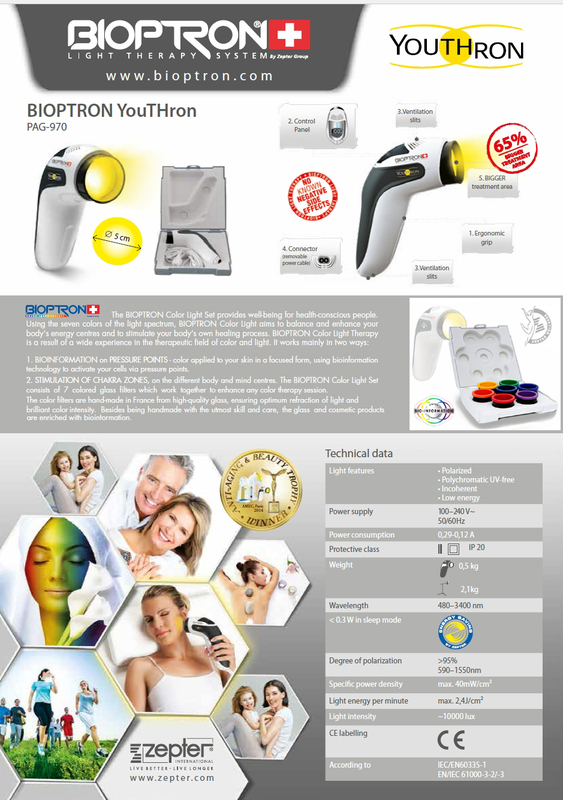 Cosmetic Light Treatment system, a revolutionary skin care device for the daily beauty care. 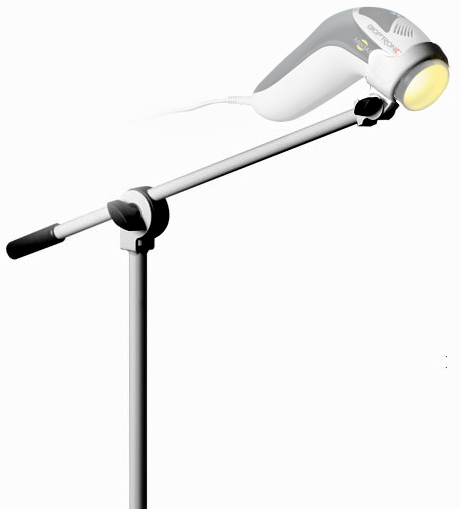 Small hand-held lamp with carrying case included. internally convert 110V or 220V power automatically. BIOPTRON floor stand allows convenient positioning to meet all individual needs. 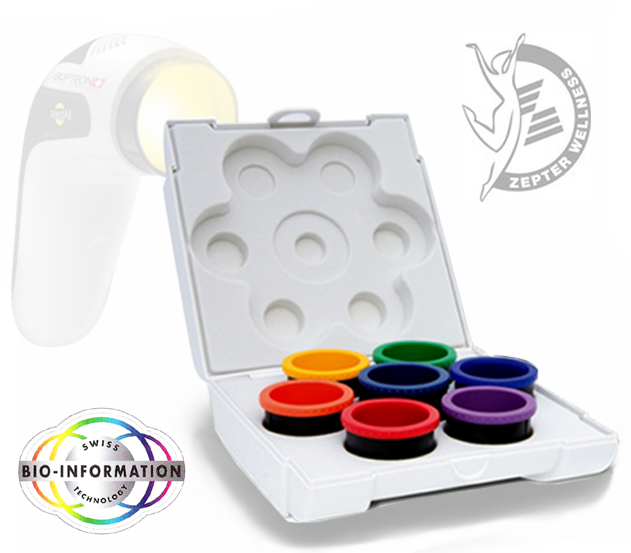 The seven colored filters are available in: red, orange, yellow, green, blue, violet and indigo. They are hand-made in French factory & enriched during the production process with bio-information. Besides being handmade, the filters are enriched with bio-information*. Using biophysical methods and devices, the Zurich-based institute for Bio-information has been developing highly structured regenerative information patterns for years. These patterns are obtained from plants, precious stones, metals, minerals, trace elements as well as inert gases, fermenting substances and more. used whenever you want to refresh and vitalize the skin. dispersion of the spray also allows the use over make up for fixation. dry, but let it dry by itself. respiration to slow down, what finally can cause premature skin ageing.